Just like the title to this post says, we (P & I), got treats from the juniors yesterday. It was Parents’ day at school. I look forward with a certain degree of trepidation as we have to meet last minute demands like, ‘mummyI I forgot to tell you but I am supposed to put alta on my palms’, etc. – as if every house is equipped with a spare pot of alta. Well, ours is after that incident. My son did not let me down this year. Just when I heaved a sigh of relief after tacking the golden tassels on the two ends of the dupatta (stole), put away the needle kit and sat down to sip my coffee, my son returned from school. They were disbursed early to rest and freshen up for the evening, and no one thought of the mommies! One look at the dupatta and he says – “Mama, I meant sides – 4 sides!” I pacified him telling it was quite alright and that nobody would miss the tassels on one dupatta with so many of them waving on the stage and left with a feeling of guilt. Turned out Jr. P got daddy to buy and staple the rest of the tassels. What a surprise! It was a great evening. All the kids performed well, were applauded heartily and I was especially proud of Jr.P’s rendering of flawless Shakespearean dialogues being the voice over artiste for the lead character of Macbeth in the play. A complete meal (Makai Bhaat) made from a magazine! This is not the first time that she is cooking – she has made dal before, but I have never allowed her to cook without supervision. I have made this too, but my version is rather different from this one. 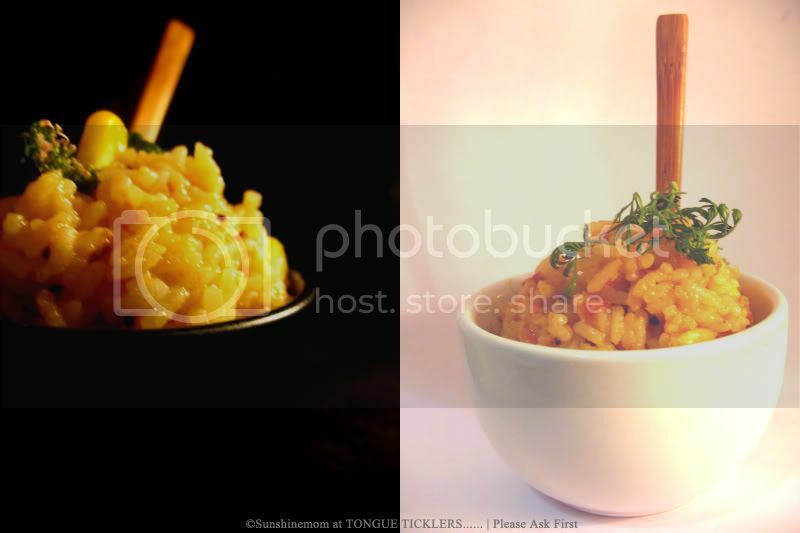 Recipe source – The recipe was featured Tarla Dalal’s magazine ‘Cooking and More’. It is a popular dish from the menu card of ‘Swati Snacks’, a small but well known eatery situated at Tardeo, Mumbai. Proprietor – Mrs.Ashaben Zaveri. The recipe did not mention but Jr.H used mustard seeds, and jeera. Heat the oil. Splutter mustard seeds, and cumin seeds. Add tomatoes and salt and saute for a few minutes. Add corn kernels and 1/4 cup water. Cover and cook over a slow flame till the corn is tender and the water evaporates. Add the turmeric and chilli powders and mix well. Add the cooked and cooled rice and toss gently so that the masala coats the rice evenly without breaking the grains. Serve hot garnished with coriander leaves and kadhi on the side. I was so thrilled I called my mom to tell her all about the evening and she was shocked. “You never did such a thing for me at 12.” Oh ya, that’s public declaration now I said. Jr. H beamed. Aren’t you just proud of your children, Harini? Do tell your daughter that her bhaat looks perfect and I’m looking forward to see more of her cooking here. And your son that the picture looks good. And that manual, I would love a copy. I’m thinking there isn’t really one that can help us deal with everything that comes our way!!! wow! You surely need to be proud od her. She has done a wonderful job! And great photos! That’s so sweet. What a lovely surpriise to come back home to!!! Wow, what a helpful daughter you have! She has done a great job! Well done! Nice pics too! Alka, I think aapne to mere mann ki awaaz sun lee!! I too am the same and imagine – I used to go round telling people nothing can ever make me cry!! Deesha, thanks for telling me that:) I guess I will keep making these with the hindalium press! Aah we mothers are so simple..first we keep on training abt good Manners to our kids ,then when they DO good, we feel threefold happiness…one tht they did good,2ndly feeling proud that we taught them so..thirdly when world praises them we go Sobbing(khushi ke aansoo ofcourse) and i wish every mother(ok ok fathers too) should be able to experience such wonderful moments when our kids make us proud.U know wht when my son wins any competition at school or tops in his class and comes home with a certificate or trophy with hyper excitement and that cute big grin….i just can’t control the gush of emotions flowing down from my eyes…nothing in the world could match that happiness ,which we feel when kids makes us feel special..so lady keep enjoying and keep sharing such memorable incidences with us. Thanks all!! She read it and is glowing with pride!! thats amazing – the little chef! 🙂 it looks great! this is a marvelous creation froma 12 year old!!! She has not onlly cooked a yummy dish but has presented it well too. Guess, soon this is going to be ur family blog. Too nice of your daughter,hugs to her.I am waiting for mine to grow up and do that ;).The bhaat is perfect especially with the young loving hands that made this under the wide-open eyes of the worrisome mother.The pix are very well presented too. WOw your daughter mad ethis for you. You must be really proud of her.